Police Investigate Anti-Semitic, 'MAGA' Graffiti at Jewish Cemetery in Mass. At around 25 gravestones were tagged with swastikas and anti-Semitic phrases; one stone was tagged with ""Oy vey! This is MAGA country"
Police are looking for the culprits that vandalized a Jewish cemetery with hate speech in Fall River, Massachusetts. 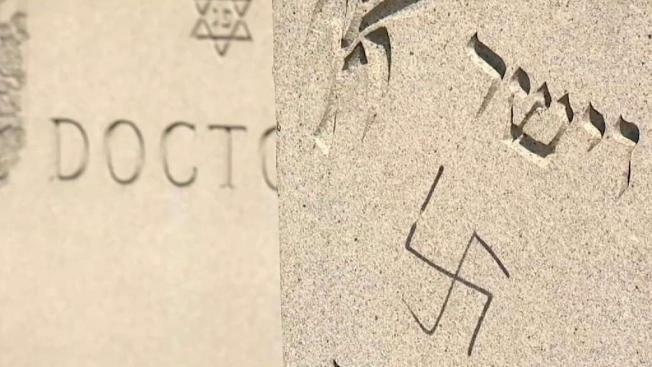 Police are investigating anti-Semitic messages and Nazi imagery scrawled on dozens of gravestones at a Jewish cemetery in Massachusetts. Fall River police say they responded to a report of vandalism at the Hebrew Cemetery at around 1:30 p.m. Sunday. The graffiti and damage was first discovered by a cemetery maintenance worker. Authorities said about 30 gravestones were tagged with swastikas, and phrases including "heil Hitler," and "Hitler was right" written in black marker. One stone was tagged with "Oy vey! This is MAGA country," an apparent reference to President Donald Trump's campaign slogan, "Make America Great Again." Some were also pushed over. Based on their investigation, officials believe that the vandalism took place sometime on Saturday. 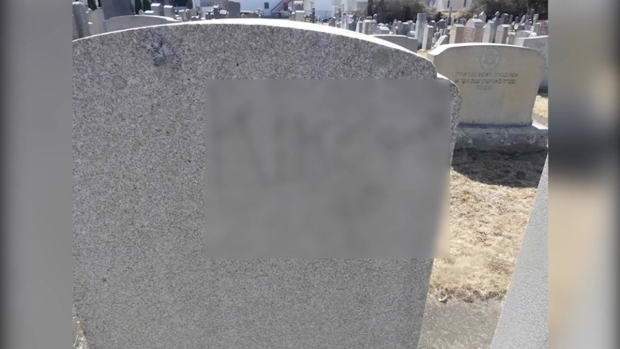 Authorities say at least 25 gravestones at a Jewish cemetery in Fall River, Massachusetts, were defaced with anti-Semitic phrases and Nazi imagery over the weekend. Lewis Brooks was stunned when he found almost all of his family's graves had been defiled. "Desecration of a religious or holy place, it's just something that’s not acceptable," said Brooks. Carl Superior, of Dartmouth, said his family's graves were not damaged but he worries about the next time. "It just seems to be getting worse and there’s a lot better things that I think people could do with their lives than desecrate other people’s rights to religion," said Superior. Police met with a neighbor who lived close to the cemtery around 4 p.m. Sunday to speak with them about a suspicious vehicle they had seen parked in the cemetary twice recently. After investigating, authorities concluded that the vehicle was unrelated to the incident. Officials are still investigating the scene to get a full count of the damaged and vandalized gravestones. "It's offensive, obviously it can't be accepted in today’s society," said Fall River Police Sgt. J.T. Hoar. Police are offering a reward to anyone who supplies them with information that leads to an arrest. In addition the Anti-Defamation League of New England is offering a $1,500 reward. "It may be a Jewish cemetery today but we know that there are many, many other groups that are under the same kind of threat," said Robert Trestan of Anti-Defamation League. Anyone will knowledge of the incident is asked to contact Sergeant Tom Mauretti and Detective Moses Pereira at 508-324-2796 or give an anonymous tip by calling 508-672-TIPS.